Introducing the new Nikon 1 flagship, the Nikon 1 V3, a thrilling camera that combines the portability of a compact camera and image quality and capabilities usually associated only with a D-SLR along with game-changing speed and accuracy. An enhanced 18.4-MP image sensor is paired with Nikon's new EXPEED 4A image processor to achieve the world's fastest continuous frame rate*, brilliant low-light performance and cinema-quality video capabilities. Add an ultra-fast autofocus system, the convenience of built-in Wi-Fi® for sharing photos and controlling the camera with a compatible smartphone or tablet and compatibility with both 1 NIKKOR lenses and legendary NIKKOR F-mount D-SLR lenses (with the optional FT-1 Mount Adapter), and the Nikon 1 V3 is a D-SLR owner's dream come true. When it comes to capturing sports, fast action and other spontaneous moments that demand fast performance, the Nikon 1 V3 is second to none. *Among digital cameras with interchangeable lenses available as of Mar. 10, 2014; based on Nikon research. Nikon 1 cameras achieve a level of speed and accuracy that once was unimaginable, and the Nikon 1 V3 takes that performance even further. Capture thrilling views of sports, fast action and spontaneous moments with game-changing continuous shooting speed: 20 fps at full resolution with full autofocus performance. When using fixed focus, increase that burst rate to a mind-boggling 60 fps and capture sights other cameras may miss. The Nikon 1 V3's Hybrid AF System uses 171 AF points for contrast detection and 105 AF points for phase detection to lock onto your subject the moment it enters the frame with virtually zero lag on the camera's LCD display. Few cameras are better suited for fast action photography than the Nikon 1 V3. Nikon's CX-format CMOS image sensor is one of the most exciting innovations in image sensor design and the secret behind Nikon 1's unrivaled speed, image quality and elegant design. 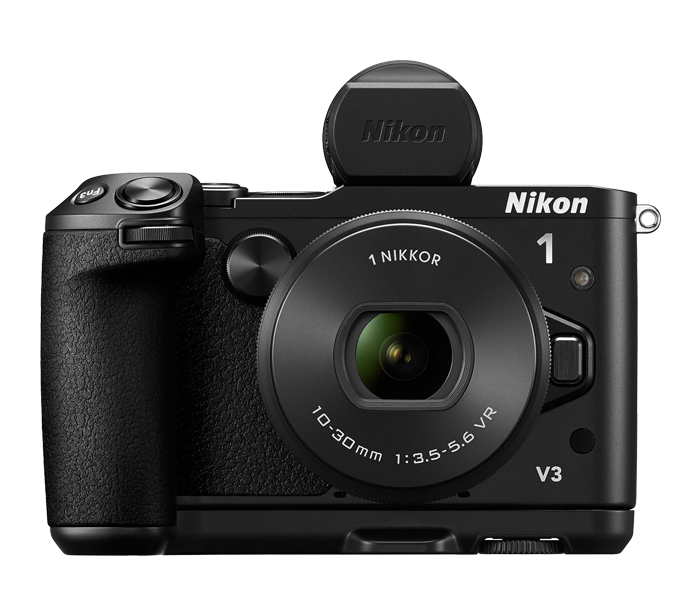 The Nikon 1 V3 pairs an enhanced 18.4-MP CX-format CMOS image sensor with Nikon's new EXPEED 4A image processor for spectacular detail and color rendering, blazing-fast speed and brilliant low-light performance. Shoot sharp, clear, noise-free photos and videos up to ISO 12,800—continue shooting in fading light long after lesser cameras have been put back in their cases. Bring the Nikon 1 V3 everywhere you go, and preserve important moments beautifully. The Nikon 1 V3 delivers exhilarating performance that will invigorate your passion for photography. Its tilting touch display has virtually zero lag, making it easy to shoot at unusual angles. Its high-end design is so streamlined and comfortable to use, you'll bring it on every outing. For those who like D-SLR-style shooting, add the GR-N1010 Camera Grip and DF-N1000 Electronic Viewfinder and feel right at home with the Nikon 1 V3. If you already own NIKKOR D-SLR lenses, add the optional FT-1 Mount Adapter and use them with the Nikon 1 V3! (The camera's 2.7x crop factor will extend the reach of telephoto lenses—turn a 300mm into an 810mm!) Whether it's a companion to your D-SLR or the centerpiece of your photography system, the Nikon 1 V3 is a camera that's hard to put down. Your smartphone or tablet will be your favorite accessory for the Nikon 1 V3. Install Nikon's free iOS or Android app and watch the outstanding photos you take with the Nikon 1 V3 appear instantly on a compatible smartphone or tablet± for easy sharing by text message, email or uploading to your favorite site. Share every brilliant view—instantly! For self portraits and group shots that actually include you, use your smartphone or tablet to control your Nikon 1 V3—see what the camera sees and take photos. Nikon 1 cameras are serious movie-making tools. Capture cinematic 1080/60p video with shallow depth of field, or turn a single instant of action into an astounding 120 fps slow-motion sequence. A new Movie e-VR (Vibration Reduction) feature keeps your videos steady during handheld shooting, and Simultaneous Still Image Capture means you can save full-resolution stills without missing a beat while recording video. Whether you're shooting home movies or commercial productions, the Nikon 1 V3 delivers superb footage. As your passion for shooting with the Nikon 1 V3 grows, so can your capabilities. Every superb lens in the growing 1 NIKKOR collection is capable of telling a new story. Add a Speedlight flash and master creative lighting techniques. Improve sound fidelity in your HD videos with the optional ME-1 stereo mic, or add the electronic viewfinder and grip for D-SLR-style shooting. Even experienced shooters can find new inspiration in the Nikon 1 V3's Creative Mode. Explore popular HDR (High Dynamic Range) shooting or apply fun effects like Toy Camera, Miniature Effect, Cross Process and more. For video, easily create funny sped-up sequences with Fast Motion or a cinematic quick-cut sequence with Jump Cut. Capture and tell stories in creative new ways. Slow down your view of fast action on the camera display and comfortably freeze exactly the right frame. Preview how your shot will look before you take it, ensuring you capture every important moment in the quality it deserves. You can even blend video, stills and sound to capture the essence of a moment with Motion Snapshot. Despite its big-camera performance, the Nikon 1 V3 is small enough to take everywhere. Its high-end design is streamlined for portability and comfort, and its exceptional speed—from powering up to framing and autofocusing to capturing—will help you catch more stunning views of the moments that matter.